Every time I hear someone complain about the cold weather, I cringe a little. The truth is, I really don't mind the cold weather. In fact, I love the festive atmosphere of fall and winter, the delicious traditional holiday food (mmm...pumpkin pie! ), and not to mention I was a winter baby, which I think means I am pretty much obligated to like winter. One of my favorite things about the cooler weather is that cranberries are now back in season! 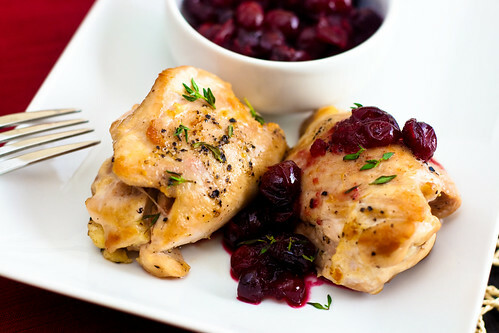 I have been waiting for months to finally get to make this Roasted Cranberry Chicken - a recipe that has become a favorite since I discovered it last year. It is easy, requires little prep, and the sauce is sweet and flavorful. The thyme adds a deliciously fine touch. This recipe will definitely be making a regular appearance on my dinner plate this fall and winter! P.S. "Natural" lighting of this photo brought to you by the magic of full spectrum light bulbs - a girl's favorite prop for fall/winter food photography!